Saturday, January 19th – Snow, Rain or Shine! 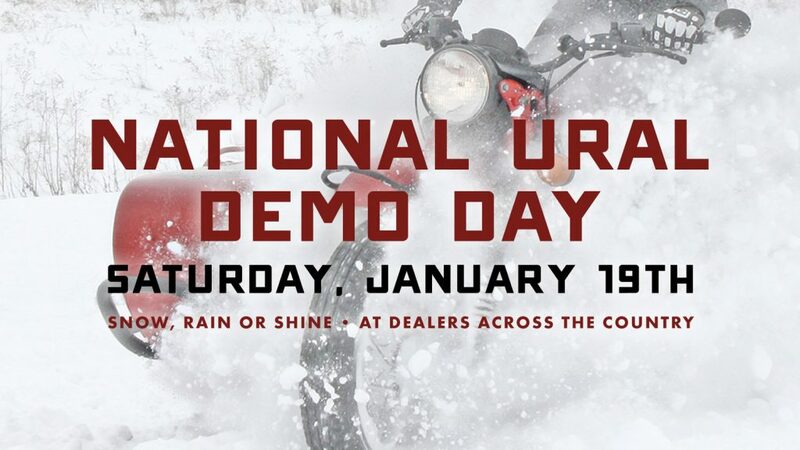 Let’s launch 2019 into full throttle – come out to your closest and favorite Ural dealership on January 19th for demos, coffee and donuts. Bundle up and go for a ride! P.S. Celebrate winter! Wear an Ushanka and get $250 toward a new Ural. Seriously. Come on out and grab some donuts or coffee or whatever other bites of food your Ural location may have. Full bellies make for better rides. Never been on a Ural before?! This is perfect for you. Our dealers will help walk you through everything you need to know. We got you covered! 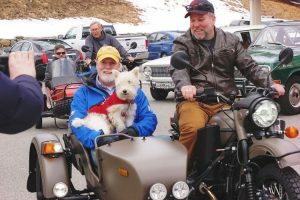 Get a chance to mingle with Ural owners. The Ural family is one of the closest and most friendly groups there is! Come out ask questions and listen to some great Ural stories. New year, new adventures! This year’s Limited Edition Ural Air encourages riders to explore further… on the ground and in the air. 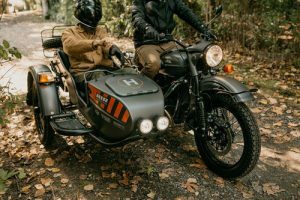 The inspiration behind this LE was to open Ural riders to new experiences, and see their adventures from a different perspective. 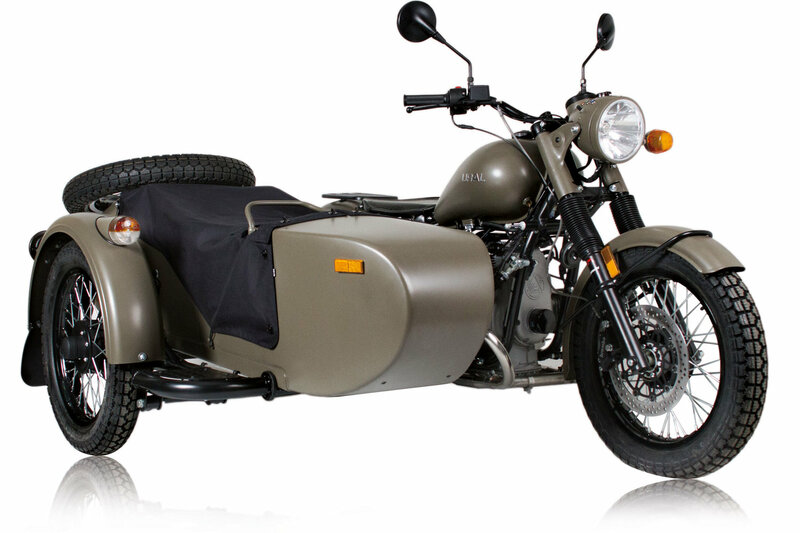 It also reflects our fascination with blending Ural’s classic design with cutting edge technologies. What’s over the ridge? What’s just beyond your campsite? What obstacles lie ahead after a big storm? When the trail ends or nightfall is looming, the rider or passenger becomes a pilot, sending out their eye in the sky to determine the best route or quickest escape. A specially designed compartment opens on the nose of the sidecar, revealing a DJI Spark drone. The drone controller is firmly attached to the sidecar with custom made RAM Mount. 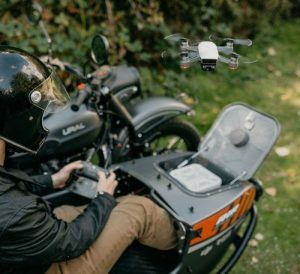 The sidecar passenger, turned navigator, can use the Spark’s video capturing technologies to gain the bird’s eye view of the path ahead. A truly unique design. Only 40 units have been made world wide! With this new design you’ll be sure to turn some heads while on the trail. Feel safer when off-roading in new areas with the drone to help guide you. This bike is certainly built for dual riders more than any other Ural. Take this year by the horns and go beyond where you have before! Spark is a mini-drone that features all of DJI’s signature technologies, allowing you to seize the moment whenever you feel inspired.With intelligent flight control options, a mechanical gimbal, and a camera with incredible image quality, Spark empowers you to push your creative boundaries. Make your own videos and show off your skills to your friends using the drone. The drone itself is not the only part of this LE that brings together Ural and modern technologies. The drone compartment is made by Stratasys. It’s a perfect showcase of the advantages of direct digital manufacturing solutions. 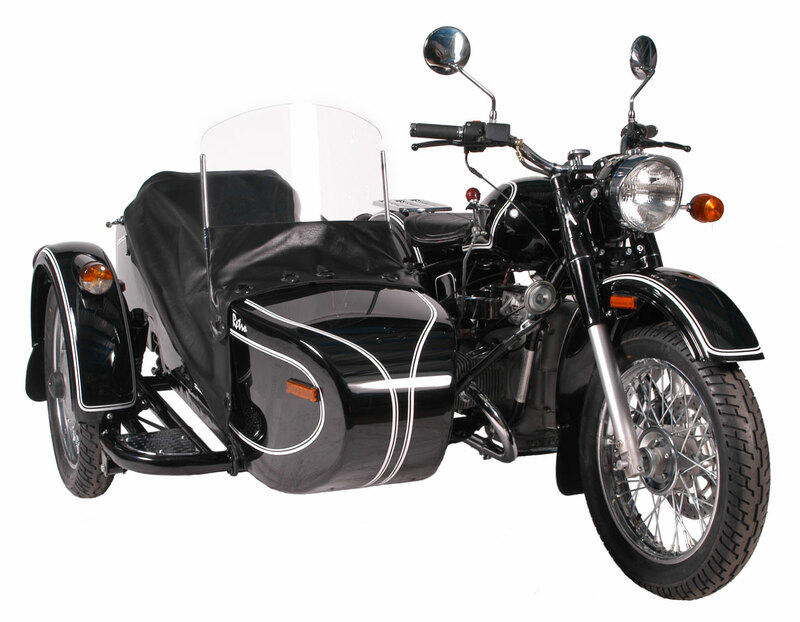 The door is activated by a push-button located under the nose of the sidecar tub and lifted by strong gas shocks. Using a specially configured RAM Mount, the drone’s controller is held firmly in place. 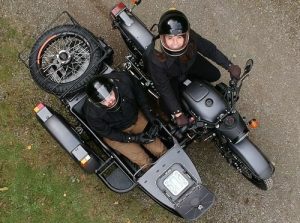 The sidecar passenger turned navigator can use the Spark’s cutting edge video capturing technologies not only to assist the pilot but also to capture and share the unique experience. Check out our website to see more specs and the Air that we have in stock! When I was growing up, we weren’t able to make sure the car was working in the best condition possible. It just wasn’t in the cards for us. So, we had to Macgyver our own way of doing things. Our car hated the winter, it was from Vegas, like us, so we understood it’s misery. So, my dad would disconnect the battery every night, wrap it in a blanket and carry it inside to stay warm. In the frigid mornings he would go out, plug it back in and away he went. It’s frightening to have to do that with a car and hope it doesn’t freeze up while your at work and now you can’t get home. No one should have to do this with their car if they can help it. If you’re not sure how to prep for the upcoming snow or just plain dreading the commute, take a breath, let’s cover some simple pro tips to help set your mind at ease. It sounds silly, but having an emergency box in your car could actually ease some stress. It doesn’t have to be a lot and it’s always better to be safe than sorry. 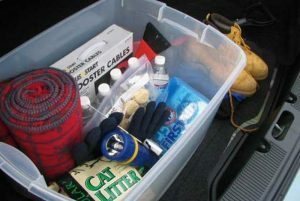 The box doesn’t have to be big and it doesn’t have to be imagined like a doomsday prep box. This is your personal supply of ‘oh sh*t I got stuck in the snow and the tow truck is going to take a while to get to me and now I’m hungry and cold’ box. What kinds of things should you put in there? With these in hand, you should feel your nervousness slip away a little bit. Being prepared for the difficult situations can change your whole attitude. Relax your shoulders. It’s going to be okay. Of course, you can do the once over yourself, if you feel informed enough about any of these processes. Although, it never hurts to have a professional take a look. Having a car that runs well and is reliable during the winter is absolutely key. Take a look at our current Service Specials to see what we can help you with this winter. Keep the windshield wipers up when the car is parked overnight or for long periods of time. It helps later when you’re trying to scrape the snow off your car. It also helps keep them from freezing to the windshield. Keep your gas tank at least half full when you the temperature is going to drop significantly. Keep at least more than a quarter tank of gas each night. Sometimes gas can freeze in the tank if there isn’t enough in there. Put Ziploc bags over your mirrors. It will help prevent icing and save you time in the morning from having to scrape the ice off. Driving in the winter can be a bit scary, but hopefully these tips will help set your mind at ease. Remember to take care of your car before things get bad. Take it slow and easy, you’ll get where you need to be this winter. There is a unique love and understanding between people who love classic cars. 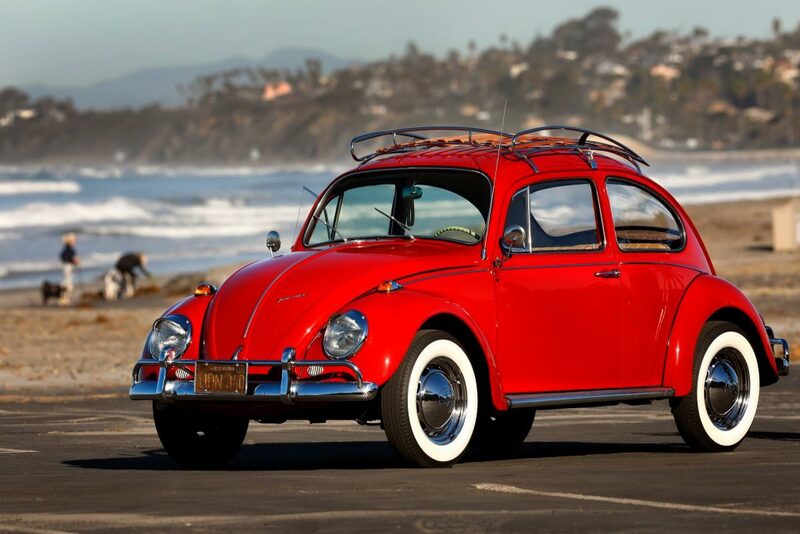 Volkswagen’s Beetle is one of the most beloved cars of all time. They’re cute, colorful, and each one has a special personality. When that personality accompanies us with each adventure we take in our lives, it becomes a part of us. We become attached and sentimental. We don’t like to let go. 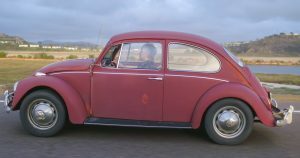 For Kathleen Brooks, her Beetle was named Annie. Brooks originally bought the car back in 1966 and has owned it ever since, racking up over 450,000 miles on Annie. Brooks tell of all the adventures she’s been on and the heart ache she’s spent with the car. It’s been a consistent presence through it all. As Brooks grew older so did Annie and the more worn out she became. After 52 years it’s not hard to see why. Of course, Brooks was very attached to Annie and didn’t want to let her go, but with so many miles and so many adventures it was becoming impossible for Annie to continue much longer. 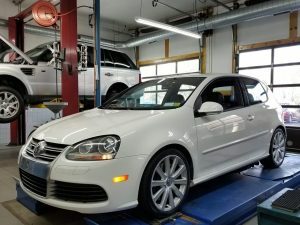 Enter Volkswagen to the rescue! They had heard about Brooks and Annie’s relationship and wanted to help and honor their loyal customer. A trip to Mexico and a 60-person team went to work on Annie. They did a complete restoration of the beautiful timeless Beetle. Taking the time to care about their long-time customers boosts moral for the company and for the persons involved. Read the full story on what went into the restoration here. Winter is slowly on it’s way once again. Whether you like it or not, it’s time to prep your vehicle. But what exactly needs to be done? What’s the cheapest way you can prep your car and still be safe? Is it worth it to prep if your car is running smoothly? These are some of the questions we will tackle in the following weeks as we look at all the safety measures to take for winter. If you’re on a tight budget like me the thought of getting new tires can be a daunting and frustrating experience. My first thought is always, “If I have all-season tires why does it matter if I get strictly ‘winter’ tires?” The answer really depends on how much control you want to have over your vehicle. If you don’t like to constantly be fishtailing down the highway on your way home in a blizzard while driving at 15 mph then you should probably think, or at least entertain the idea, of getting new tires. It’s here that I too would inwardly groan. Is there really that big of a difference between all-season and winter tires? 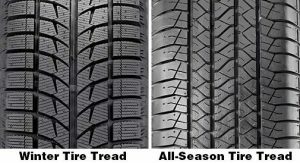 “All-season” certainly sounds like it would have more benefits than a tire that can only perform in one season. Let’s break down the difference between the two tires to the left. First off, when looking at any tire there are three things to keep in mind and it all has to do with tread. The pattern, depth, and compound of the tread. These are key points for any tire, because each variation changes how it will perform on the road and weather. 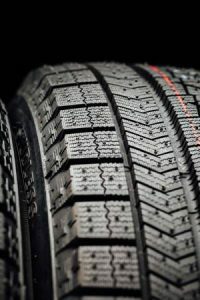 The pattern of a winter tire matters because it needs to be good with low traction conditions. The depth of the tread will determine how much slush and snow it pushes away from the car. The compound of the tire will tell you how much grip the tire will have on the road. The deep groove in the center of the winter tire, shows the depth. The cross hair pieces will thrust the snow and slush away from the car and clear the way. It might be difficult to see, but the all season tire seems smooth to the touch, while the winter tire has all sorts of all in the rubber. A softer and more malleable tire performs better in cold conditions, while the all season tire can get cold and harden, which gives less grip and control. I think this has swayed at least my mind about winter tires. The idea of having more control sounds appealing. I don’t want to be one of those people I see in the snow on the side of the highway in the middle of a blizzard. Whenever I go out this winter I want to feel completely safe. Studs can be helpful in certain conditions, but not all, which means you could be switching tires through the winter. Another downside of studs is that they aren’t legal in every state, because they can damage the road. If they are legal in the state you live in, check how icy the roads get in the winter. The studs dig in like little ice picks and help push you along. If the roads you travel vary between slush, snow, and actual plowed concrete, it might not be the best decision to choose studs for your every day driving. What is the alternative? Winter tires. There are really only two types of winter tires to choose from. Studless or Performance. Studless tires are the most aggressive tire for the winter. The reason is because of the tread. This tire performs at its best when winter is at its worse. The colder it is the better they work. They are designed to work in icy and snowy conditions. Having these on your car ensures that you have maximum control of your vehicle during the winter. These tires will get you to and from work with increased safety for yourself and anyone else on the road. So are these right for you? Take a look at the routes you drive. What does you job ask of you when it snows? These are things to keep in mind when deciding between snow tires. Performance tires might seem less quality after talking about studless, but that’s not the case. These tires have a different take on winter. They give optimal handling control to the driver. They offer the ability to have that summer drive feel in the middle of the winter. Performance tires are the median between all-season and the aggressive studless design. Realistically, these tires are for drivers who have more mild winters than some places. It could also be for those who are able to stay home during storms and go out when it’s more clear or wet. A lot of drivers who don’t want to abandon their sports cars during the winter will choose performance over studless. Why? These tires are built to perform and grip for the driver’s needs. With winter coming quickly, it’s important to know that you’re ready and feel prepared. No one likes to be caught out in the cold. Take some time and really think about your choices for tires this winter. Do some research on what is best for your driving style and needs this winter. If you need tires, but aren’t sure where to get them, we can help you. Contact us and ask about what winter tires are for you. We can have some specially ordered for you or come look through our inventory of tires. We can be sure that you are safe and ready to go all winter long. In recent years using carbon fiber material used for sports cars and race cars has gradually increased. It has become quite a major player in shaping the future of automobiles. Carbon fiber was invented by Thomas Edison in 1879. 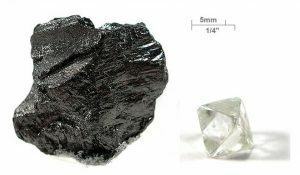 Edison used it in his light bulb endeavor and it would take a long time until carbon fiber’s full potential was realized. Even today, we have yet to unlock the full capabilities of the material. The real question is why we humans are using carbon fiber to begin with and why, more importantly, are we using it on our vehicles? Is it something that can harm our environment or is it something that can help save us? Let’s find out. What is Carbon Fiber, Actually? Time for a small science lesson. Carbon is an element. It’s something that makes up diamonds, graphite, gold, and more. When you combine carbon with a polymer and you weave them together you get carbon fiber. It makes a sheet like material that is flexible. It’s an easily manipulable material, which makes it easy to mold into any sort of shape you could desire. To keep the shape, resin is added into the mix and then it’s a waiting game for everything to set. When it gets to this form it’s called carbon fiber reinforced plastic or CFRP for short. Using the CFRP has been a game changer for several reasons, but whenever we humans find something good there’s usually a catch. The same goes with using carbon fiber. Weighing out the pros and cons is crucial for any company who wants to invest in a relatively new technology. Let’s start with the cons. It’s important to set the expectation bar low so we can be happily surprised when it comes to the advantages bit. The biggest problem with carbon fiber since it’s origins is how expensive it is. Price is an issue, because it means it’s not accessible to the every day consumer. Even today, the price per pound is about $4.40 while steel is about 89 cents. Not only is this a problem for consumers, it’s a major issue for businesses who want to utilize the product. This is why it takes extremely large companies to almost monopolize on the product before anyone else. Airline companies, and race car brands such as those who race in Formula 1, neither of which benefits the average person. Even larger than expense, is the energy it takes to produce carbon fiber, it takes a lot more than it does to make steel. Meaning, it spews a significant amount more of greenhouse gasses than steel. For those of you who don’t know, that’s a bad thing for our planet. It also takes more man power, which costs money; and the process is a lot slower than steel and other metals, which costs even more money. Clearly, money is a major problem for companies wanting to use the product. One could argue that this is the reason why most race car brands only build some car pieces out of carbon fiber, because it cost too much. The last problem with carbon fiber is that it’s basically plastic. Not that flimsy straw type of plastic, but the strongest type of plastic ever. Thus, it’s abbreviation CFRP. Being plastic means that it’s not biodegradable. It’s not environmentally friendly. When someone stops using it, it doesn’t corrode or rust into nothing, it lasts a lot longer. So any scrapped production of carbon fiber could and does end up in some heap somewhere and doesn’t really ever go away. Kind of like the massive amounts of plastic that floats around in the ocean and seems near impossible to get rid of. Except this is land where 99.9% of humans live and we can’t say “out of site, out of mind”. However, this is not the end of carbon fiber’s story. The best thing about carbon fiber is that it is 100% recyclable. While, the initial energy it takes to create carbon fiber is major, recycling any unused bits of the material can be used again and takes less energy to do so. This means that if someone didn’t like how their mold came out, they could melt it down and start over. Any shavings or bits that aren’t used don’t have to sit on the floor or in a heap outside somewhere, they can be melted down and big a new life. Car got into an accident and is too damaged to drive again? Not to worry, it doesn’t have to rust in a junkyard. You know, the recycle life. Strength and weight have everything to do with why carbon fiber is being used on fast moving vehicles. It is 5 times lighter than steel and 10 times stronger than steel. We’ve already talked about its longevity and durability, but these are, again, major factors as to why brands are slowly and steadily replacing steel car bits with carbon fiber. Why is it important that vehicles are lighter and stronger? For those of you who love electric cars, this is extremely important. With a lighter car, it takes a smaller battery to use, which makes sense for any economical vehicle. The lighter the vehicle the easier the engine has to work and makes better fuel consumption. 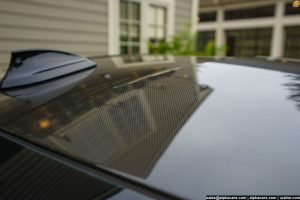 Another fantastic function of carbon fiber is when it is used as safety pieces within the car itself. Because carbon fiber isn’t like normal plastic and isn’t like steel, it is extremely difficult to brake when in an accident. Some F1 cars and race cars are using carbon fiber to reinforce the bumper, doors, or hood. Increasing the safety of occupants in the car has made it very desirable for consumers to latch on to the technology as soon as possible. 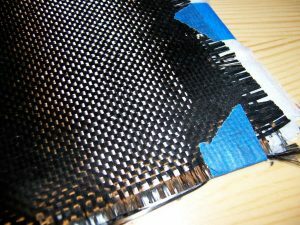 Another unique bit of carbon fiber is the use it has for motorcycle rider gear and helmets. It provides a key factor in safety of any automobile operator. Some companies are making the beds of their pick-up trucks out of carbon fiber, to increase their load amount, enhancing their vehicles’ strength and durability. Other companies such as BMW are looking for how to utilize the weight of the car so it can go faster. By replacing their cars’ roofs with carbon fiber sheets, they are cutting the roof weight in half. It gives the car a better center of gravity, creating better handling, and even faster to drive. While it has been years since Edison found carbon fiber, we still have yet to fully utilize this precious material. With so many companies embracing the technology it won’t be long until we can see carbon fiber vehicles available for the consumers who can afford it. As for the environmental side of things, it’s difficult to say whether or not this can save us, but if not used properly it could cause more harm and good. Something to think about. We do have two vehicles available for purchase at AlphaCars right now that have these unique carbon fiber features. The 2015 BMW M3 and the 2012 Bentley Continental GT. 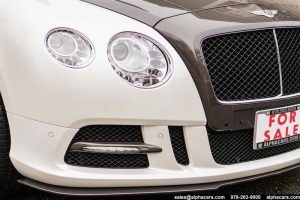 The BMW has the carbon fiber roof, while the Bentley has used multiple facets of the material both inside and outside of the vehicle. May of ’72 racing history was taking leaps and bounds with BMW Motorsport. With the cooperation of several Italian automotive companies including Lamborghini and Giugiaro, BMW began taking charge of racing. With the collaboration in place and the first product rolling onto the track, BMW’s racing legacy had begun. During the beginning years the Motorsport series (later changed to ‘M’ series) was only for racing. They had built the most powerful engines of all time with 100 horse power on a single engine without any turbo added. Truly an amazing accomplishment. 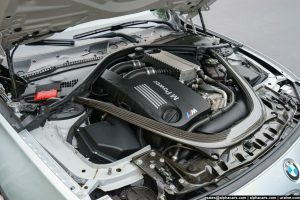 Today BMW’s M series is still one of the most powerful engines available for consumers. 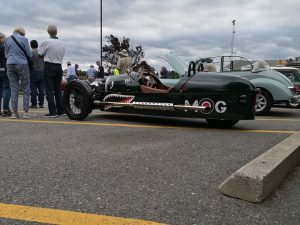 Even better, these race cars are now street legal and can accommodate any amount of passengers needed; from SUV to sedan the ‘M’ engine remains the same. These days the engines are turbo charged for the maximum amount of speed capability. 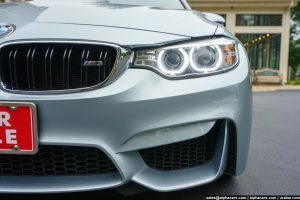 BMW keeps true to their roots by using the logo on all ‘M’ vehicles. The blue stripe represents BMW and the Bavarian region. The red stripe represents Texaco who partnered with BMW at the beginning of their racing endeavors and the purple stripe signifies their partnership together. Making something great and building history even today. 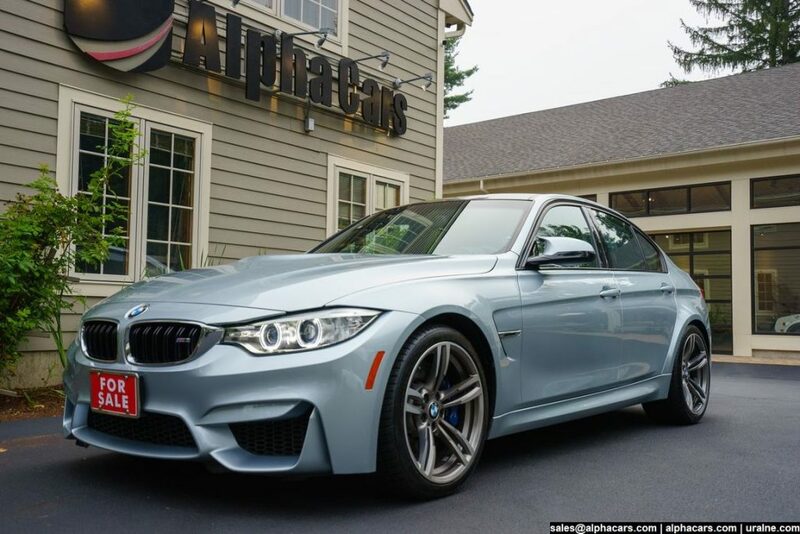 Current BMW M Sport Inventory<– Check out what we have in stock right now. Summer is my favorite season. I always try my best to fill it with as many adventures as possible to make up for my hibernation during winter. One activity stands out from the rest. It’s a low key event on Thursdays in Stow, MA at the Minute Man Air Field. This is where air meets road. Each week there is a different theme of unique cars and planes to check out. Great food and good music to relax with, all while admiring the beautiful cars people bring from all over. Just last week I saw something I’d never seen before. It looks like the Bullet from Mario. I have no idea what it is, but it’s amazing. I wasn’t able to get a photo, but someone also brought a beautiful Triumph car (didn’t know they made cars) that had the most immaculate shade of blue I had ever seen. On American night we had to have some fun and bring out the 2016 Dodge Challenger Hellcat. There were a lot of people interested in this American gem. With the color so vibrant it’s hard to miss. 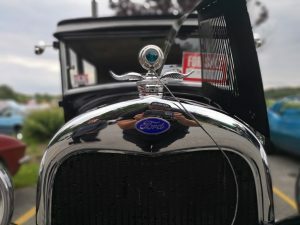 Another amazing car I saw during American night was a ’32 Ford Truck. I had just recently been watching a video of someone building one. To see one in real life was incredible. I kept walking by, gawking, extremely impressed. This gentleman was even selling it! I couldn’t believe it. In fact, there are a lot of older vintage vehicles that are for sale each week. 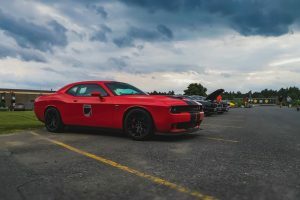 One last thing about Wings and Wheels that sets it a part from other car shows is that each donation that they receive goes right back into the community. They help out with high-school programs, senior citizen programs, and internal service projects. No one gets paid to set this up, it’s all volunteer based by a group of people who want to bring like-minded people together. It’s really great to see someone use what they love as a way to improve the community they live in. Or you can follow them on Facebook . Save the date for July 28th! 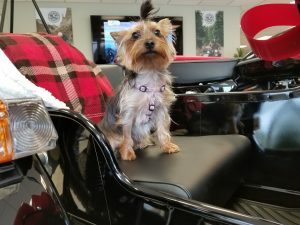 Last year we opened up our new AlphaCars and Ural Motorcycles store in North Hampton, New Hampshire. 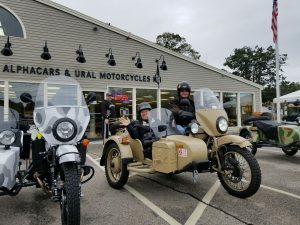 This year, we are proud to bring North Hampton’s first annual Ural rally day! For those of you who own Urals, we encourage you to come out and enjoy the day. 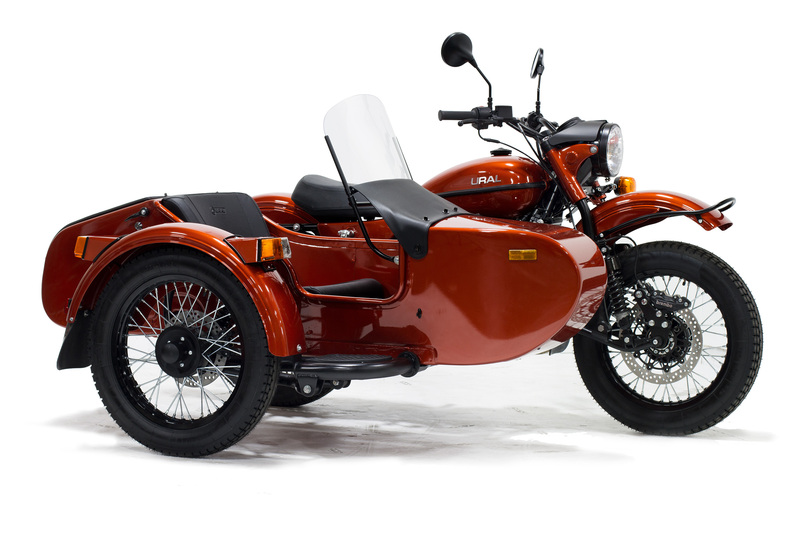 We will have our latest Ural models in North Hampton for you to admire and take a look at, just in case you’re feeling like you need an upgrade. In addition you can check out our latest t-shirts, mugs, tumblers, and other Ural apparel and accessories. Want to test your skills on a Ural? We will have an agility course set up in the parking lot. Don’t have a motorcycle license? No problem! We will have our qualified Ural staff take you around the course, showing you just how well the Ural can maneuver. True to our typical annual rally in Massachusetts, we will have a ride through North Hampton, but those plans are still pending. Absolutely, bring your gear, it could be a hot summer day out on the street. When our plans our finalized, we will let you know more details. 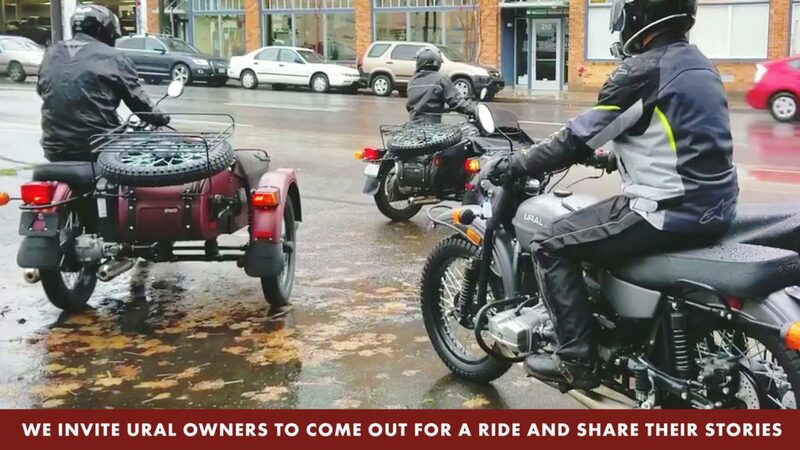 This is your chance to mingle with other Ural owners, hear their stories, and be welcomed into the Ural family. In the afternoon we will be serving up BBQ food items to satisfy your rumbly bellies. Bring the family, bring the dogs, everyone is welcome. We look forward to seeing you there! Interested? Let us know you’re coming by registering (free) through EventBrite.